The over one billion people on Facebook are not likely to use the website in a similar manner, nor are they likely to have similar motivations just because they happen to like the brand, or be in the same demographic segment. Recognizing that a brand’s diverse Facebook followers respond to different value propositions, we took into account the aggregate behaviour and motivations of Facebook users, and developed a simple yet powerful framework that enables brands to effectively engage the Facebook community and encourage positive eWOM. Specifically, based on the users’ propensity for content creation and consumption, the following consumer segments were identified: attention seekers, devotees, entertainment chasers, and connection seekers. 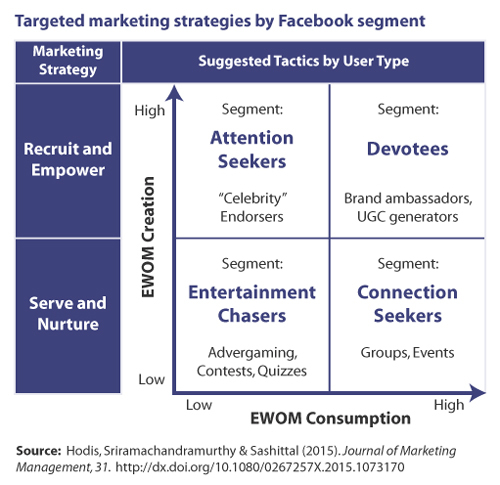 The corresponding four segment marketing strategy framework, provides the necessary understanding of a brand’s heterogeneous Facebook audience and their motivations, which then allows brands to create and deploy attractive content that will not only engage their followers, but also grow and strengthen the Facebook brand community. Attention seekers are the stars of their very large, mostly loosely linked, Facebook community, and can serve as very powerful real-life celebrity endorsers. Brands can leverage their own social capital and use it to empower attention seekers to become the face of the brand for their network of Facebook friends. Appropriately rewarded, attention seekers will create the needed social buzz and lend their own online social capital to the brand’s image making it inherently ‘cool’ in each attention seeker’s social circle. Every Facebook community has its own attention seekers who just need to be recruited, empowered, and validated through conspicuous, brand-initiated interaction. Devotees, given their propensity to spend large amounts of time on Facebook, and their stronger ties to their Facebook social networks, are ideal brand ambassadors. They want to interact with the company and are eager to share their opinions. Marketers should tap these high creation-high consumption individuals to create, post and disseminate their own brand related content on the brand community’s page as well as their own wall. Devotees will be a brand’s main content contributors, provided that the brand validates their efforts. Entertainment chasers are characterized by a low level of both creation and consumption on Facebook in general. As such, they are not willing to make much of an effort and will not engage in the brand community unless there is something in it for them, be it a tangible or intangible reward. Serving and nurturing these short attention span entertainment chasers should be done by a variety of means. While entertaining videos, quizzes, polls, games are all highly recommended, in order to hold their loyalty, marketers are strongly encouraged to combine entertainment with competition by conducting contests. Connection seekers, provided they are appropriately nurtured, will form the bulk of what could be called a brand’s Facebook page “regulars” and thus serve a critical role in the survival and growth of the brand community. The true measure of success for Facebook marketing is not the number of people ‘liking’ a brand’s page, but the number of people who continue to interact with it in some shape or form after the initial adoption period. The brand’s ability to keep these ‘regulars’ engaged hinges on whether it not it can effectively nurture meaningful consumer-to-consumer interactions. It might be a brand community, but it should not be about the brand, rather the emphasis needs to be on the lives of those using the brand, especially when it comes to engaging connection seekers. Since their true motivation is to ‘hang out,’ the only way to nurture a continued relationship with connection seekers is by co-opting them in brand events, or allowing them to form and participate in brand-centric groups. This segment will tune out unless interacting with the brand enables them in some manner to interact with their friends and even make new friends. Successfully applying our four-segment consumer engagement approach is not about choosing a segment and targeting it better, but rather about understanding that all four segments are present in the brand’s existing audience and need to be engaged with in a way that takes into account their inherently very different preferences and motivations for engaging with the brand as well as the Facebook environment. To build a successful brand community on Facebook, marketers need to deploy well-rounded campaigns, with content and engagement tactics that simultaneously appeal to all of the four segments. At a minimum, when it is not possible to engage all segments, it is absolutely essential that the content/campaign elicits both strong creation and consumption activities from consumers. For example, if the only two segments engaged are both low creation, such as entertainment chasers and connection seekers, the limited, mostly brand posted content, will quickly become stale and any elicited engagement will be short lived. It is not enough to maintain an up-to-date, interactive, and personalized brand page on Facebook. The success of the Facebook brand community is contingent upon shared ownership of the page and brand presence with its Facebook audience. The four segments identified in this study should all be actively involved in the creation, curation, and dissemination of the page’s content. By applying our four segment strategy, the brand becomes an invited member of the larger Facebook community instead of being perceived as the ignored and sometimes creepy interloper. Friend endorsement of Facebook brand pages legitimizes the brand’s presences in the online community to the point that it is not even seen as marketing. For a full description of the four segments of Facebook users, more details on the four segments marketing strategy, as well as examples of successful engagement campaigns, please refer to the full article published in the Journal of Marketing Management. Monica A. Hodis, Ph.D. is Associate Professor of Marketing at the St. John Fisher College School of Business in Rochester, NY. She holds a Ph.D. in Business Administration specializing in Marketing. Her research explores consumer behaviour in the realm of social media, branding, haptics, and gaming. Rajendran Sriramachandramurthy, PhD is Associate Professor of Marketing at the Saunders College of Business at the Rochester Institute of Technology, in Rochester, NY. He holds a Ph.D. in Business Administration specializing in Marketing. His research is focused on the adoption, use and abuse of technology within a marketing context. Hemant C. Sashittal is Professor of Marketing at the St. John Fisher College School of Business in Rochester, NY. His research interests include strategy implementation, product innovation, and social media marketing. Ana Canhoto discusses the sentiment analysis of social media conversations and her research with Yuvraj Padmanabhan on manual and automated analysis of Twitter data. The Internet-of-Things (IoT) is developing quickly. In this post, Bang Nguyen and Lyndon Simkin identify several important issues, or dark sides, that IoT providers should be taking into consideration.